Stephanie Caruana has a long and impressive writing career spanning 72 years. She’s interviewed Maya Angelou and Flo Kennedy. She’s written books, articles, and plays. With all the many credits to her name, she is most famous for her creation, in the seventies, of A Skeleton Key to the Gemstone File. In the 1960s and 70s, physicist/historian Bruce Roberts wrote a thousand-page political journal stating that Aristotle Onassis was the prime mover of President John F. Kennedy’s assassination, together with the Mafia; and also, that he kidnapped Howard Hughes, and ran Hughes’s empire as his own. This journal became known as the “Gemstone File” because Bruce Roberts made and sold synthetic gemstones to other countries, together with his political information. Stephanie was fortunate enough to meet Roberts in person and felt that this information should get into the hands of everyone. Unfortunately, approaching traditional publishers with this kind of explosive information was unlikely to work. She wrote her 28-page typed summary, or “skeleton key,” to Roberts’ massive epic between February to April 1975. Then she copied it on photocopiers and sent it out, asking everyone who got a copy to make another copy and send it on. Soon millions of copies were circulating world-wide. The CIA tried to block its spread, but in the pre-Internet era there were still ways to disseminate information. The document passed hand to hand. By 2006 a groundswell of interest had built up over the Gemstone File and its meaning. Stephanie’s Skeleton Key was simply a brief summary and readers wanted more. 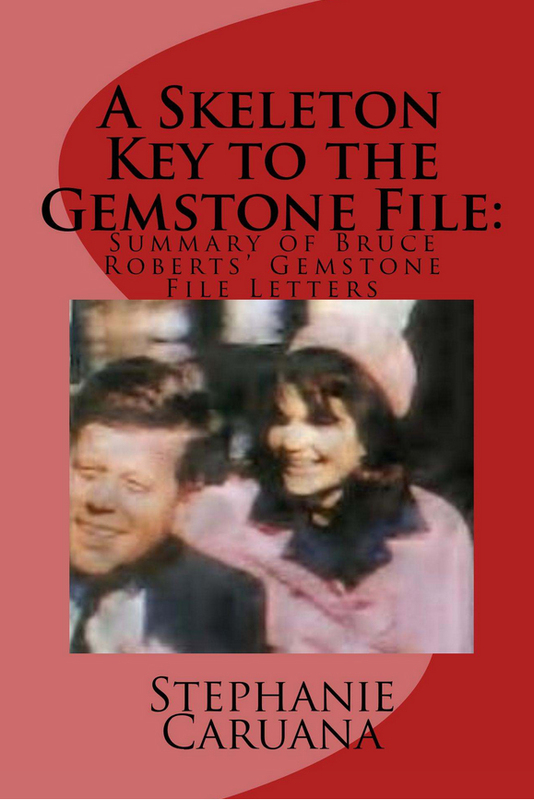 In response, Stephanie wrote The Gemstone File: A Memoir – a full 480-page book which includes the Skeleton Key, 250 edited pages from Bruce Roberts’ notes, and an in-depth evaluation of the material by Stephanie. This also became quite popular. In the past few months Stephanie has been working on republishing both the Skeleton Key and the Memoir in revised paperback and ebook format. She’s also working on other related projects. Her reputation in this area is impressive – just check out the Wikipedia page about Roberts’s Gemstone File which repeatedly mentions her. If you’d like to know more about the hidden relationships behind the Kennedy family, Onassis, and other movers-and-shakers of the sixties and seventies, Stephanie’s books are well worth a read. We have a true famous investigative journalist in our midst!